The NoGii Super-Protein Bar from NoGii is high voltage, high-energy, and even higher protein to meet men’s higher nutritional demands. 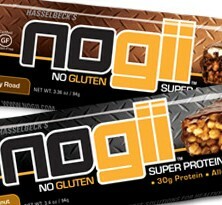 Available in 2 flavors it comes with up to 10 grams more protein than the NoGii High Protein Bar. INGREDIENTS: NoGii Protein BlendTM [Soy Protein Crisps (Soy Protein Isolate, Tapioca Starch, Salt), Milk Protein Isolate, Whey Protein Isolate], Organic Tapioca Syrup, Unsalted Peanut Butter, Milk Chocolate Flavored Coating [Sugar, Palm Kernel Oil, Nonfat Dry Milk Solids, Cocoa Powder, Soy Lecithin (emulsifier), Salt, Natural Flavor], Natural Caramel (Brown Rice Syrup, Sweetened Condensed Milk, Evaporated Milk, Sugar, Palm Kernel Oil, Heavy Whipping Cream, Distilled Monoglycerides, Salt, Soy Lecithin, Disodium Phosphate), Organic Agave Syrup, Vegetable Glycerine, Peanut Flour, Pure Water, Arabic Gum, Natural Flavors, Sea Salt. Allergens: Contains Peanuts, Soy and Milk. 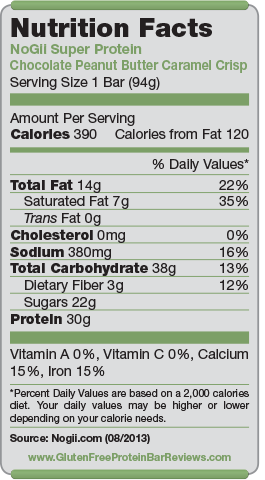 Nutrition facts based on Chocolate Peanut Butter Caramel Crisp flavor. Facts and ingredients vary by flavor. Champion ATP Tennis Pros, all are attributing this dietary change to their success. sound like a trend, but a Gluten-Free diet may be one long-term key to improving athletic performance. Buyers agree that the taste is phenomenal and definitely one of the best tasting high protein bars currently on the market. Candy bar comparisons are not uncommon regarding taste. The chocolate quality got good ratings from reviewers, but it can get flaky if the bar got warm during shipping. The caramal mentioned in one flavor couldn’t be tasted too much. Super Protein Bar has a crunchy and chewy texture. Carbs and Sugar are on the high side, but it’s also a 94 gram bar, which moves the numbers a little more into perspective. 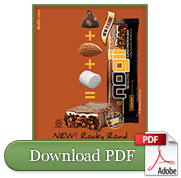 Main protein source is soy, but there’s also a blend of Milk Protein Isolates and Whey Protein Isolates in each bar. $3.81 retail for a high protein bar like NoGii Super Protein is a little higher than average but the taste and texture is very competitive and makes up for the price. The price is the reason in most reviews why this bar did not get a full 5 star rating, but only 4.5 stars. With larger distribution, the price should go down over time though. 30 grams of protein is a lot and it fills me up for a few hours. Tastes great!